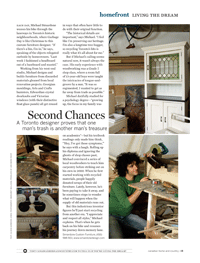 Michael dutifully studied for a psychology degree — “growing up, the focus in my family was on academics,” he says — but his textbook readings only made him think, “‘Hey, I’ve got those symptoms.’” Rolling up his diploma and ignoring the ghosts of shop classes past, Michael convinced a series of local woodworkers to teach him carpentry before striking out on his own in 2000. When he first started working with recycled materials, people happily donated scraps of their old furniture. Lately, however, he’s been paying to take it away, and he sometimes stops to wonder what will happen when the supply of old materials runs out. But this industrious inventor figures he’ll just start recycling from another era. “I appreciate and respect all styles,” Michael explains. That’s when he gets back on his bike and resumes his journey down memory lane.